IN THE TOWN follows Miles, a struggling yet aspiring radio producer and lover of weed, as he balances friendship, purpose and community in Oakland’s vibrant and heavily politicized queer community of color. Read part two below. (Click here if you missed part one). Zeba and Miles snickered as they opened the tall rhinestone door to Juelz, joking that its ghetto fabulous extravagance reminded them of an early 2000s Ja Rule video. Once inside, the duo quickly realized why piercings were only $25. Juelz was a moderately sized storefront, with a glass counter dividing the front waiting area from the small employee space behind it. There was a cracked door leading to the back room which didn’t appear to be occupied. The waiting area was partially lit with a flickering ceiling light. Old, emptied boxes were stacked along both walls. There was a bubble gum machine that looked like the candy hadn’t been changed for at least 2 years, and a special edition People magazine marking Obama’s presidential reelection victory in 2012—that stung. “You sure you wanna do this, baby? I mean, it seems…a lil’ ratch,” Zeba observed. “Cheap?” Zeba jeered with a soft giggle. She knew Miles hated having to pinch pennies. But he walked them both directly into this disaster. “You tried it,” Miles deflected with a self-conscious side eye. “Let’s just see if someone is here before we scratch it off the list. Hello?” Miles’ voice echoed into the vacant space. Betta be street if you lookin’ for me. Miles and Zeba were the world’s biggest Beyoncé fans, with Destiny’s Child being their favorite girl group of all time. They’d often spend an entire afternoon watching behind-the-scenes Destiny’s Child videos while reenacting their famous performances. “Soldier! I love this song. It’s so southern. Reminds me of home,” Zeba reminisced as she began browsing the nose ring options in the catalog on top of the glass counter. “Oo, look at this.” She pointed to a picture of a dreadlocked beauty with two large studs in one nostril and two oversized hoops in the other. “You can still go down on people. You just gotta be careful,” remarked a distant voice from the back room. Zeba and Miles both jumped, startled by the unexpected presence of another person. A tall Black man emerged from the back room. “Didn’t know I was back there huh? Gets ’em every time,” he snickered as he approached the glass counter. Zeba and Miles gave each other an uncomfortable glance, not quite sure what to do next. “Hiii…I’m Miles,” he carefully responded, as the weed was beginning to significantly delay his reactions. “What can I do for you?” Derk inquired. Derk couldn’t have been over 40. He wore an oversized white tee with fitted jeans, showing off several tattoos along his arms and up to his neck. His eyes were dimmed, leading Miles to assume that he, too, was high. “Hey…so I’m interested in getting my nose pierced…I called and spoke to someone about 30 minutes ago…I think,” Miles struggled to get the words out. “Yeah, we aren’t doing piercings right now,” said Derk. “But…aren’t you…a piercing shop?” Miles replied in confusion. “We are, my man. We just don’t got no more nose rings. Haven’t had a customer since yesterday, honestly. So I just been chillin’,” Derk replied with ease. “Well, when can he get the piercing?” Zeba chimed in. “Won’t have our next shipment until later on this week. But you can try again tomorrow, I got ya,” Derk replied aloofly. “Why would I try tomorrow…if you won’t have them until later this week?” The marijuana was intensifying Miles’ bewilderment. “Don’t you only give piercings here?” he probed. “Actually, we’re diversifying. Take a look at these,” Derk bent over and brought up an oversized black duffle bag packed with DVD’s of 90s TV and film classics. “Ooo” Zeba peered into the bag. “Moe to tha, E to tha, Moesha! I need this.” Zeba was the biggest Brandy fan. She and Miles would often debate over who was the better 90s R&B star. She was team Brandy while Miles was a supreme Toni Braxton fan. “Wait, I came here for a nose ring. Is that not gonna happen?” Miles questioned as Zeba exchanged $10 for the set. “Nah, bruh. Don’t look like it. But thanks for the business,” said Derk, before retreating to the back. “I don’t even understand,” Miles wondered as they exited the shop, positioning themselves on the sidewalk. “How does a piercing shop run out of jewelry to pierce your nose with…and how do you plan on even watching that DVD? …your computer doesn’t even have a disk drive,” Miles pointed out to Zeba. “No, but my mom has a DVD player and she loves Moesha.” Zeba calmly reassured him as they walked up the street. “We used to watch Moesha every Monday night when I was a kid. So we can watch when I see her next time,” Zeba reasoned. “Touché. Moesha was life. But back to the dilemma at hand—what do I do now? It’s already 4 and we’re running out of options,” Miles responded. He seemed overly tense, which meant only one thing could make him happy. “Candy store!” Zeba shouted with a big smile. “Let’s go to the candy store. It’s seriously right across the street. Plus, a good munchies break is just what you need right now. What’s it called? Big Dee’s Market, hehe,” Zeba chuckled. She was right. Miles had the biggest sweet tooth, much to his dentist’s dismay. And snacks couldn’t hurt the brainstorming process. He hadn’t eaten since that morning so it was time to recharge. “You know me so well, shawty. Let’s do it.” Miles responded while crossing the street. Big Dee’s Market was a meager storefront owned by a local Latino resident, with about four aisles of goods. At the entrance was a sparse assortment of fruits and vegetables, followed by three rows of sugary treats. Before Miles could fixate his attention to the candies aisle, he bumped into a familiar face. “Hey roomie!” greeted Sur, Miles’ new roommate. “Hola guapa. What you up to?” Miles replied as he gave her a big hug. Born in LA to Mexican parents, Sur had lived in Oakland since she was 3 years old and had witnessed its rapid changes firsthand. She would often point out the differences in the neighborhood on her and Miles’ roomie walks. “I feel that. Selenas, Selenas always makes me feel better, too,” Miles replied with a sigh as Zeba racked up eight dollars’ worth of snacks at the register. “Que pasa, honey? You look a bit worried.” Sur remarked as they all began the 10-minute trek home. “I’ve been trying to get my nose pierced all afternoon but that’s proving more difficult than I imagined,” Miles replied. “Ooo, you would look so cute with a nose ring,” Sur consoled. “Seriously? What am I, like, giving you?” Zeba inquired. She’d recently begun reading about indigenous healing at the cafe and was genuinely intrigued by Sur’s observation. “Yeah, actually. My white neighbor keeps being unreasonable about my cat. He even filed a complaint to my landlord. It just makes me so mad that his ridiculous, irrational anger can potentially affect my living situation,” Zeba rambled. She dreaded confrontation and normally kept her feelings bottled up. It was the first time she’d articulated how she felt about this neighbor. Miles could see the relief in her eyes. “Aw I didn’t know this was bothering you so much. He’s so petty for filing a complaint,” Miles added. He’d begun to realize how self-absorbed he was today, and how little attention he’d given to Zeba. “Come here Zeeby,” he took Zeba in his arms and squeezed her until she choked with laughter. “Thanks baby,” Zeba replied with a smile. “Yeah, my landlord just texted me about it. Says he wants to talk about Jungly later. I can’t give up my cat. I’m not giving up my cat!” Zeba declared. She recently found Jungly in front of the café before work and fell in love with her neurotic behavior. She reminded Zeba of a wild jungle lion. Thus the name Jungly. “Oh my gosh that’s so sweet. Yes please. I wan’ all uh dat,” Zeba gushed. “Jaja, no problem, guapa. I’ll get started on that now,” Sur said, as she hopped up and went to the kitchen to get brewing. “I love her!” Zeba exclaimed to Miles. He loved Sur too. She’d been his first stable roommate since he moved to the Bay. The housing crisis, coupled with his dismal finances, did not conjure much apartment success. However, he and Sur got along amazingly. They’d chat in the kitchen for hours, listening to old Latin grooves on her record player and swapping dating stories. They were the perfect pair. “Yeah, I definitely won on the roommate challenge,” Miles bragged. “Yes, right!” Miles was delighted to shift the focus back to himself. “Well, first off, obviously we need to re-up on the weed. Then the ideas will come to us in no time! If we can remember them,” he laughed to himself. “I thought you’d never ask.” Zeba pulled out a joint from her jacket and started puffing. “I knew you had something up your sleeve. Literally,” Miles remarked as he took a hit. “You know,” Zeba pondered aloud as she drifted away. “We can probably do these piercings ourselves. My mom pierced her own nose in my grandparents’ basement back in the day. She said all she had was a diaper pin, an eraser and an ice cube,” Zeba recounted. “Yup, she still wears it to this day. Honestly, we don’t have many options. Maybe we should just try it,” Zeba suggested. The weed made Zeba’s proposition seem tempting, but Miles wasn’t that high. No way was he going to stick a needle into his own nose! An evening of DIY nose-piercings was not what Miles had imagined for himself when he set out on this adventure. Miles texted Juan who quickly replied that Sebas was up for the challenge. “And no need for a diaper pin, Thank God. Sebas has everything we need,” Miles said with relief. “Amen to that,” Zeba raised her hands to the ceiling. “Let’s call a Lyft and head over there now,” Miles said, eager to finish what he started. “Ok, ok. But oneeee more hit,” Zeba pleaded. Miles giggled at her desperation. “LOL you totes sound like a crackhead. But do dat, do dat,” Miles encouraged as he joined in for his last hit of the day. 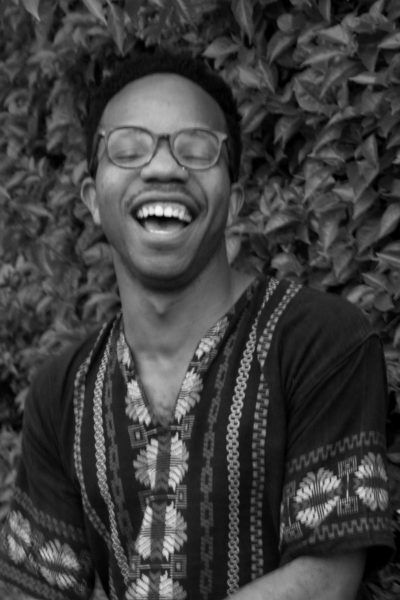 Marrion Johnson is a Black, queer storyteller and communications strategist based out of Oakland, California. Born and raised on the South Side of Chicago, Marrion uses storytelling to speak to the complex realities facing Black communities, including displacement, queer and trans identities and Black joy. Marrion has called Oakland home for two years now, but Chicago will always be where his heart is.